-Similarly, the leveled "challenge" mode asks you to recreate a sentence using the above grammatical categories. SENTOPIARY - Create - A Hungry Bull from eeiioo on Vimeo. Sentopiary is fun and engaging, as well as aligning with research demonstrating the importance of phrase elaboration for development of literate language. Kahmi (2014) states "There are three basic ways to make sentences more complex: (a) noun phrase elaboration, (b) verb phrase elaboration, and (c) conjoined and embedded clauses." This app includes contexts for (a) and (b), but not (c)- so I wrote to the developer and requested that they consider this! They promised to do so for future updates. -incorporating sketching or visualization strategies about constructed sentences and at the same time increasing bombardment/elicitation of the structure. -utilizing the app's potential for absurdity in constructing sentences. So check out Sentopiary- looks like a great tool for a wide age range! WHAT is an EdCamp? An EdCamp is a FREE unconference for educators who love to further their learning. Interested in becoming an EdCampAccess SPONSOR? Learn more here. REGISTRATION Ready to Register? Don't miss out on your opportunity to Register here! SpeechTechie is Five Years Old...Looking Back! Next week marks my 5th Blogoversary! This is always a great time to look back at how this blog has affected my life- putting me in touch with all you great people via these posts, and sometimes in person! Thanks for reading! Again looking back, I often like to compare analogue or even "retro" tools to the tools that are available to us today. 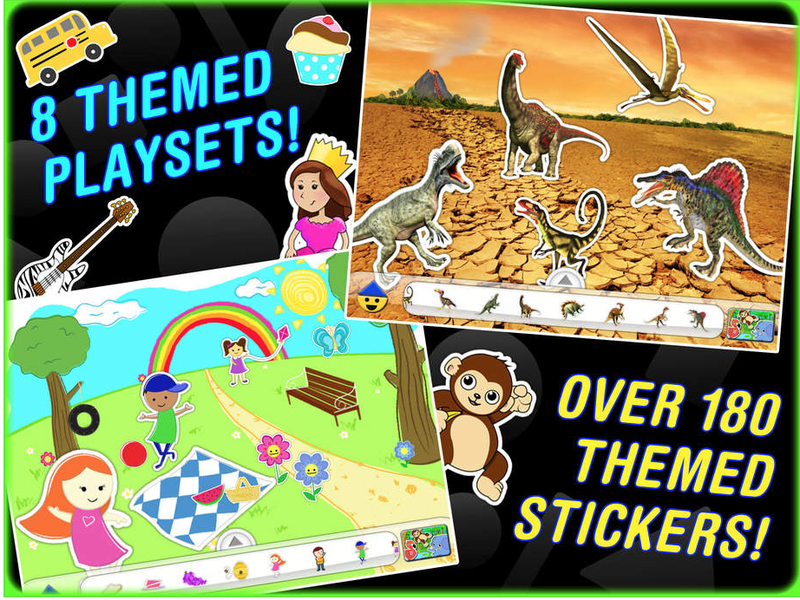 "Sticker book" apps- those that let us make a simple visual scene- provide a good example. I always ask groups, "Remember Colorforms?" I certainly do- those low-tech (and Farily Priced) visual scene sets were often given to me as a reward for enduring some kind of epic shopping trip as a kid. Apps that let you assemble characters and objects within a scene are often FIVES-Friendly- Fairly Priced, Interactive as a creation tool, Visually representative of language, Educationally Relevant to Curriculum Contexts, and useful towards speech and language objectives, or "Speechie"
I have pointed people in the direction of the Buildo or ClickySticky apps for these purposes but was recently pleased to stumble across the free, simple, but context-rich Colorforms Revolution app. -Create scenes with visual contexts for language targets (pronouns, verbs, elaborated phrases, causals). -Structure action sequences within a setting or add an initiating event or "Kickoff" in Story Grammar Marker® parlance (perhaps an absurd element from another set, as these are accessible in the app) to develop narrative skills. -Analyze the scenes and objects for articulation targets. -Screenshot your scene and then use the image (App-smashing) with an app that allows you to add text (Pic Collage) or audio (Book Creator, Screenchomp). As we wander down this road of technology integration, it's nice to see the development of web-based educational tools that are mobile-friendly. Historically, due to iPads not supporting Flash, many great resources could not be used in your Safari web browser on iPad. Jeopardy Labs (navigate to https://jeopardylabs.com in Safari on your iPad or any web browser on your computer) stands as a step forward as a web tool that works anywhere! Electronic versions of Jeopardy have been around for some years, but previously involved use of a rather complicated Power Point Template. Make one mistake--or download a template that has an error--and it could derail your whole activity. -conjunctions- "make a sentence using..."
Your game will be saved under a password and you (or collaborating teachers, or students) will be able to access the game from any device. Consider also having students create the game with you--or for each other--which taps definition construction and other skills. In honor of the just-concluded ATIA Conference in Florida, which I didn't make it to this year, I thought I'd feature a helpful tech tool for you as an educator- and one which you might be in the position to recommend for your students. Many school districts and professionals are now using Google Apps for Education- a suite of tools with amazing features for all students. Within Google Apps (aka Drive) are of course a word processor, presentation creator, drawing/diagramming tool, spreadsheet creator, and organization, sharing and collaboration tools that are found nowhere else! TextHelp has created Read and Write for Google, a terrific add-on to Google Apps that can be used in the Google Chrome browser on a computer (i.e. not on an iPad, though Text Help just released an iPad app that I will need to explore). Once the Chrome extension has been added, within your Google Documents a toolbar is accessible that provides text-to-speech (so, for any document provided to students by the teacher, or as an editing tool), text prediction, picture and text dictionaries, highlighting and more. For SLPs, I especially like the vocabulary tool that will collect highlighted vocabulary words within a document and add them to a new document with definitions and pictures for each word. Within intervention sessions, Read and Write would be useful for its web research component- the toolbar is also accessible on webpages so they can be read aloud and highlighted, as well as reviewing and highlighting documents, teaching editing skills, and the above mentioned vocabulary feature. 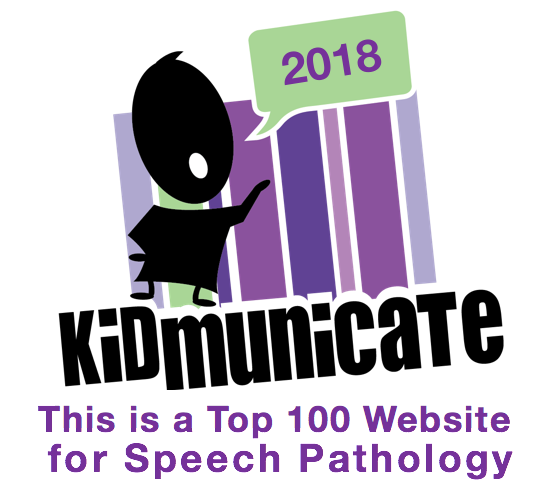 For students who would benefit from long-term access from all the above tools, after 30 days a subscription ($99 annually) is required but the text-to-speech feature remains free. Educators, after adding the toolbar to their own Google account/Chrome browser, can apply for a free premium teacher subscription. I have produced a tutorial handout for installing and using Read and Write for Google that you can find at this link.